On January 11, 2019, when jointly meeting the press with Minister of Foreign Affairs and International Cooperation Alie Kabba of Sierra Leone, State Councilor and Foreign Minister Wang Yi expressed that China is the largest developing country and Africa is the continent with the greatest concentration of developing countries. With a shared future and destiny, China and Africa are walking on the right way forward and engaging in the just cause, which has gained support from the people of the vast number of developing countries. Wang Yi said that Minister of Foreign Affairs and International Cooperation Alie Kabba chose China as the destination for his first overseas visit this year and Alie Kabba was also the first foreign minister received by the Chinese side this year. A few days ago, I just concluded my first visit to Africa in 2019, which has been a diplomatic tradition upheld by China for 29 years. 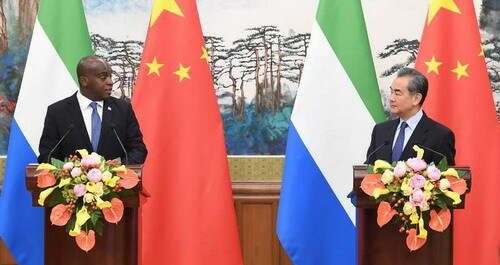 All these fully reflected that China-Sierra Leone relations as well as China-Africa relations are close and friendly, and indicated that both countries have taken each other as a priority in respective external exchanges. Wang Yi expressed that currently, the development of China-Africa relations is faced with the favorable condition of the Beijing Summit of the Forum on China-Africa Cooperation and the joint construction of the Belt and Road Initiative, as well as the rise of unilateralism and protectionism. It is a common responsibility for China and Africa as well as China and other developing countries to make the global governance system more just and reasonable and build a new type of international relations. We should demonstrate to the international community the strength of unity of developing countries and jointly promote the development of China-Africa relations, so as to make contributions to the progress of human society.